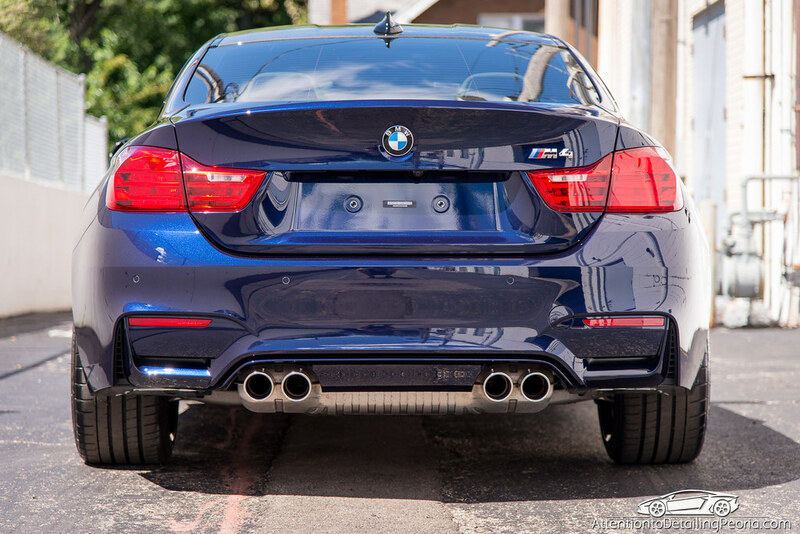 I’ve always been a fan of the M product line, and the styling of the M4 is a real attention grabber. This vehicle was purchased with moderate water spot etchings and signs of many bad car washes from its time spent on the dealership lot. 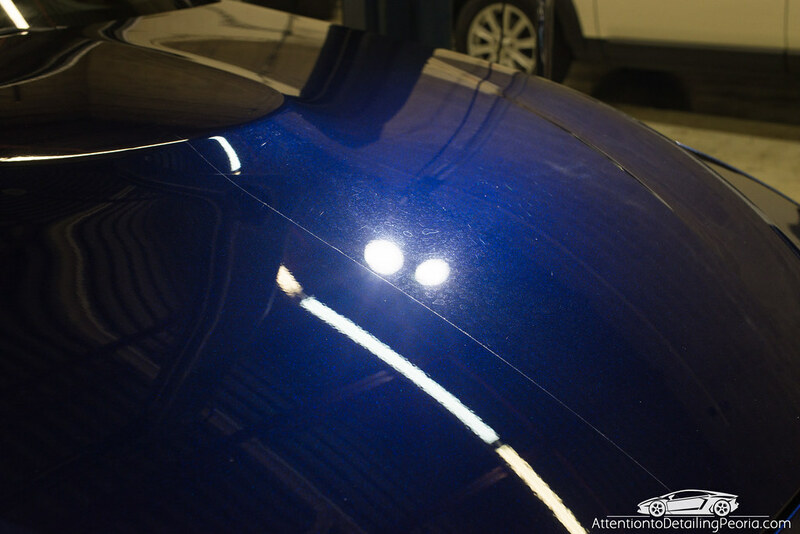 The new owner wanted us to restore it to its true glory and make it look like a new car should, so we set out to remove the majority of defects from the finish and apply a durable layer of protection to the paint and wheels. 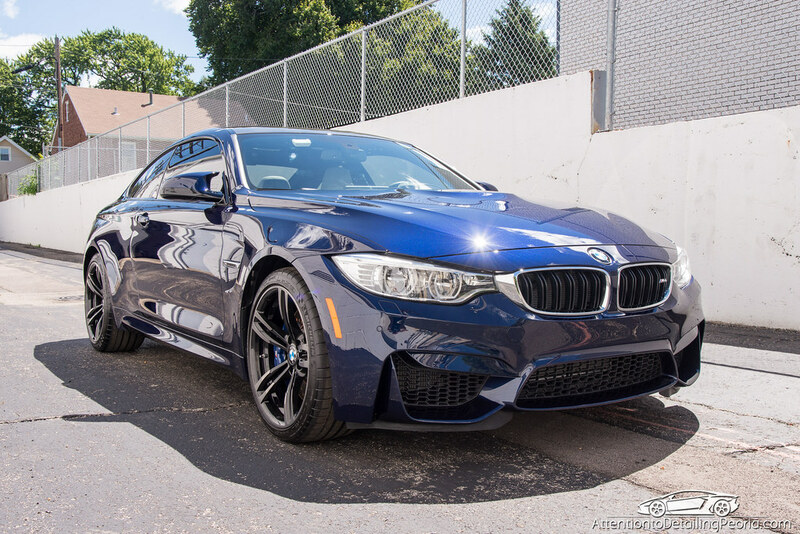 To begin, the exterior of the vehicle was carefully washed and decontaminated. 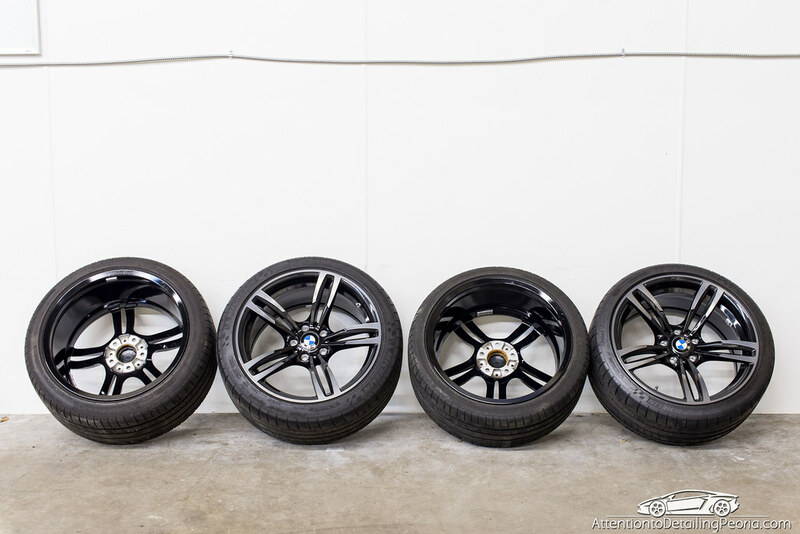 Since we were going to be removing the wheels, we did not worry about cleaning them during the regular wash process. 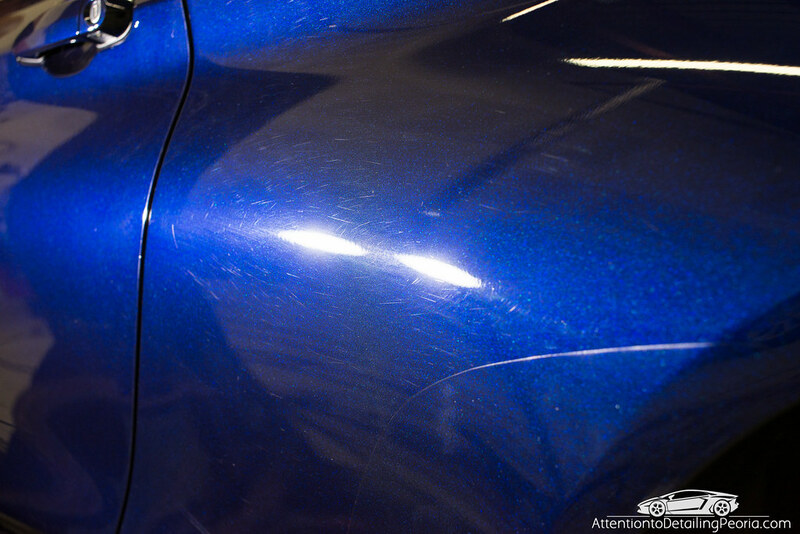 Once clean, the damage on the paint was easily visible. This brand new car looked worse than many used vehicles due to several very poor car washes at the dealership. Water spot etchings covered only the front of the vehicle, a sign that perhaps the car was parked near a sprinkler on the dealer lot. 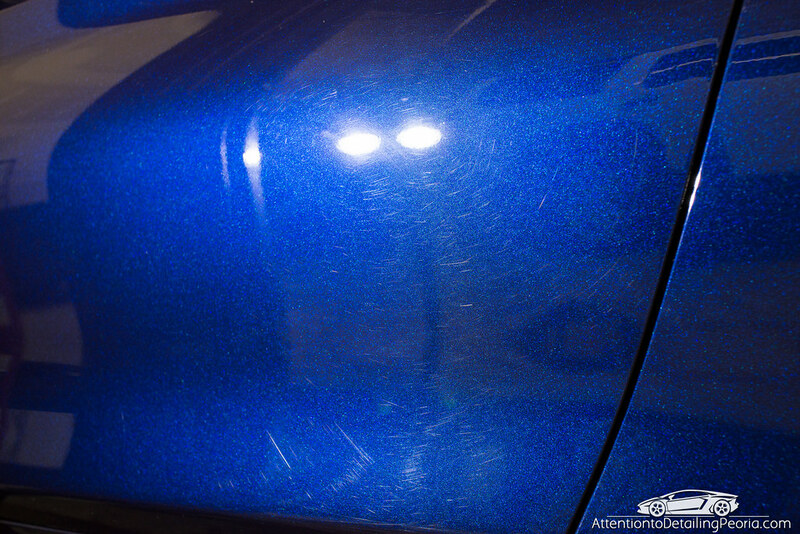 Our two-step paint correction process removed these etchings, revealing a nearly flawless finish. Here are some other before & after shots taken during the compounding process. 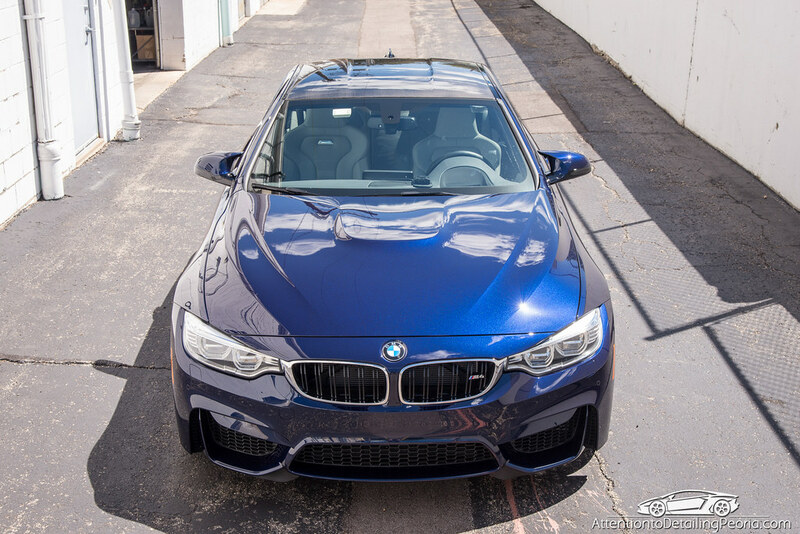 After the vehicle was compounded, a fine finishing polish was used to restore clarity, color, and gloss. Notice how much deeper the right side is after final polishing compared to the haze that was left after compounding. 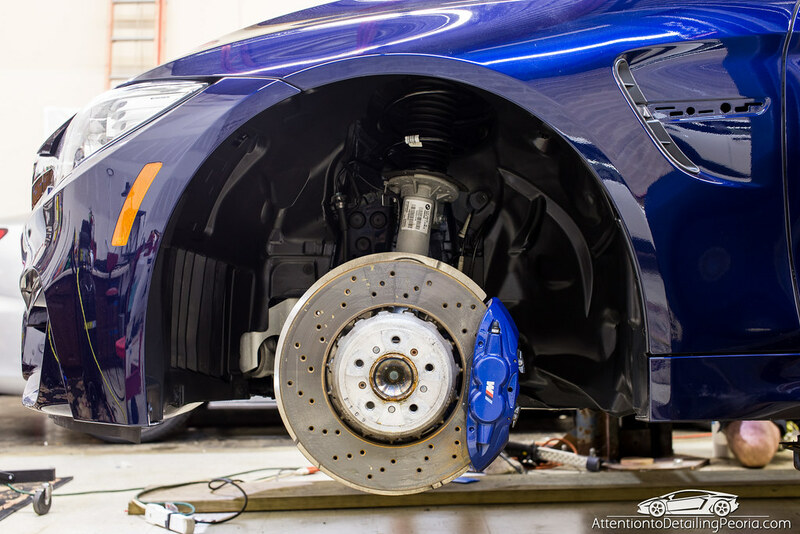 During the process, the wheels were removed, deep cleaned, and nano coated. While we had the wheels off, the wheel wells were cleaned up and dressed. The brake calipers were also cleaned and then nano coated. 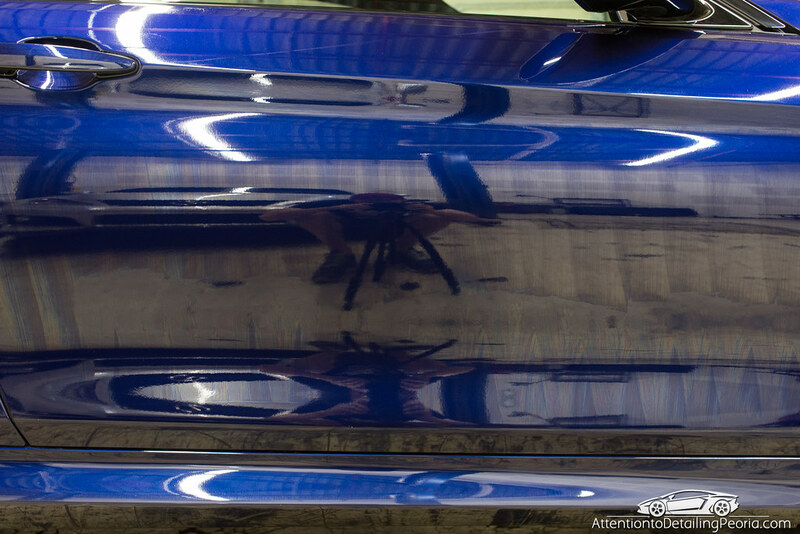 I then applied a nice layer of 22ple’s premium professional coating, Mistico Elemento. 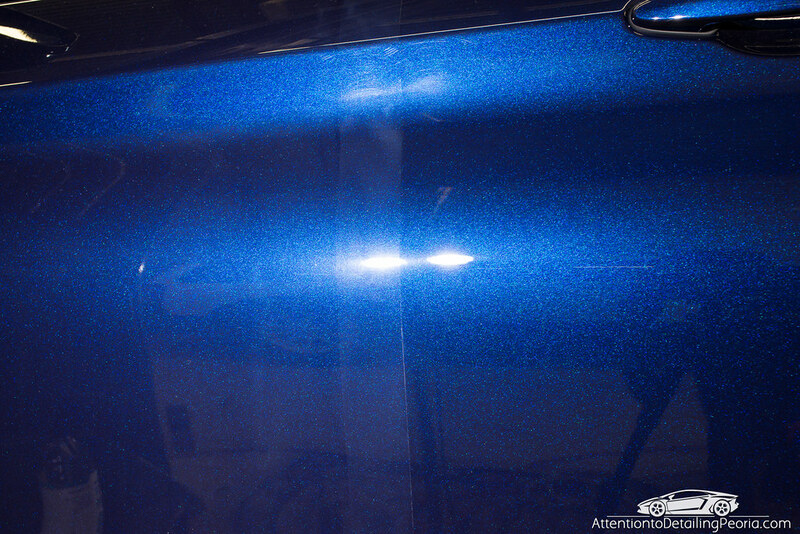 Look at that clarity and gloss after removing the coating residue. I could stare at this car in the sun all day. 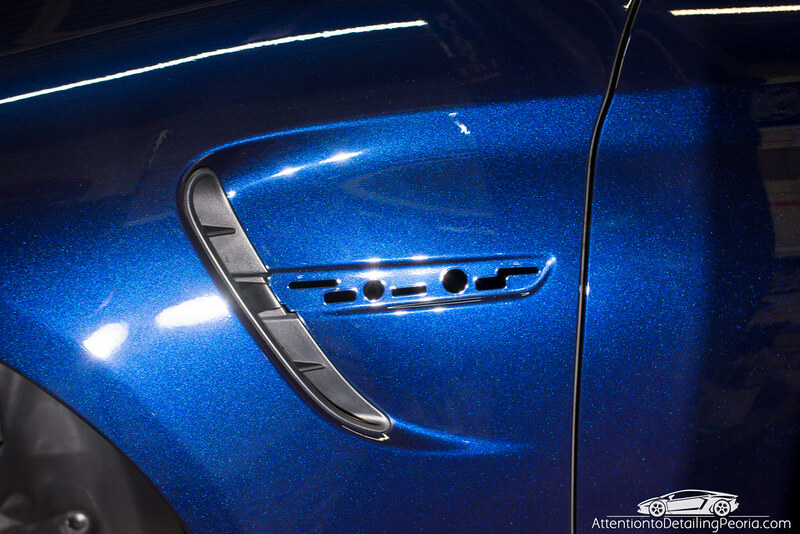 This tanzanite blue metallic individual paint was absolutely ridiculous. 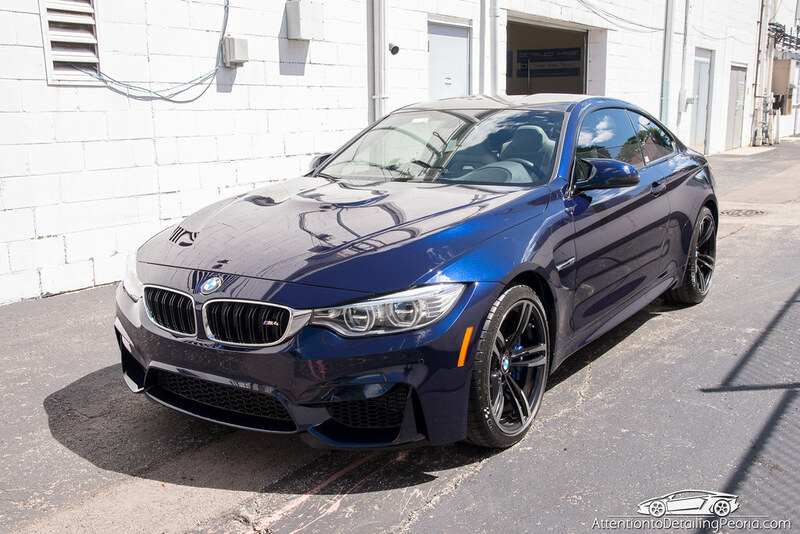 We work on a lot of great looking vehicles, but this paint color has to be one of my absolute favorite. The metallic flake is brilliant! Hi John – thanks for reading! Great work, taking it to another level when you remove the emblems. 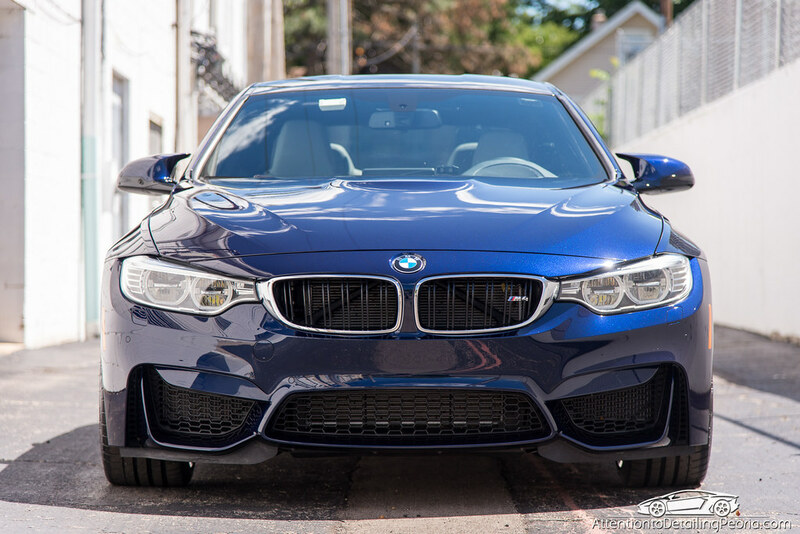 Love the look of that BMW and the paint color. Ha! Very true, Jeff. Thanks! 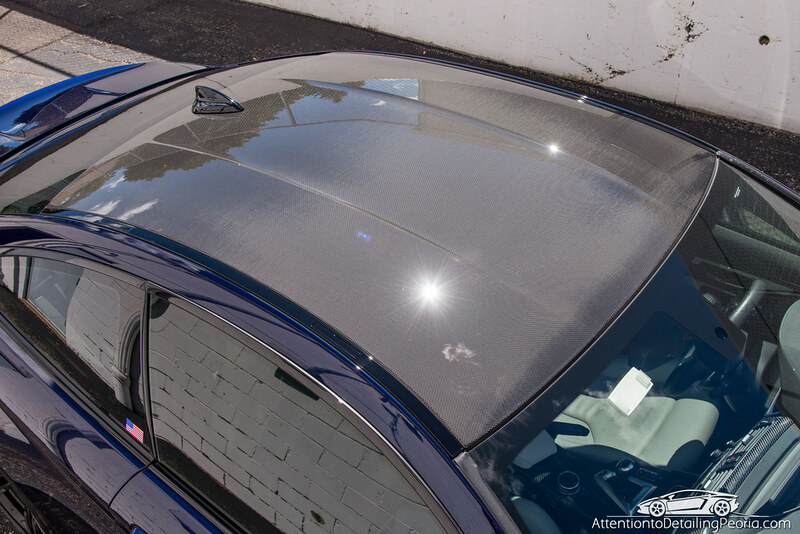 Masterfully polishing down , how do you catch the haze symptoms and out of the trouble ? Hi Hans – I’m not sure I understand your question. Could you please help me to understand what you’re asking? Thanks! Thanks for the comment, Bryce! 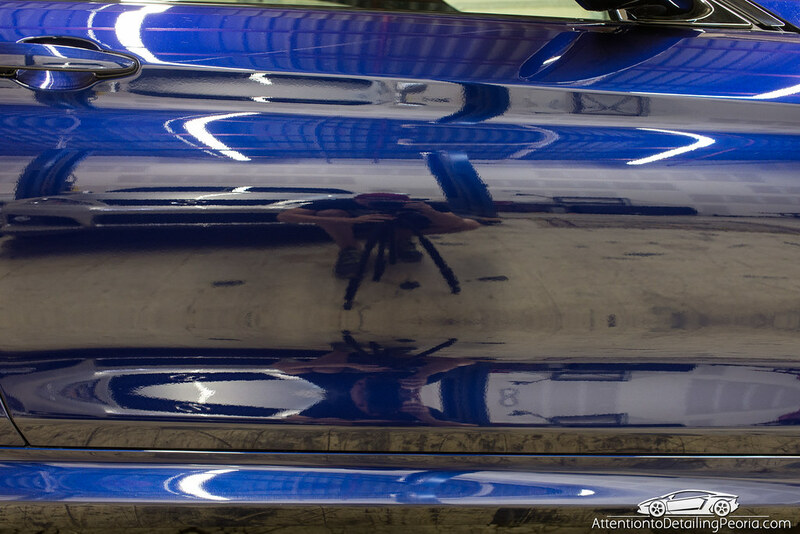 I had one question, do you prime the yellow Rupes pad first with CarPro Essence or do you just put the three or four dots of polish then start polishing? 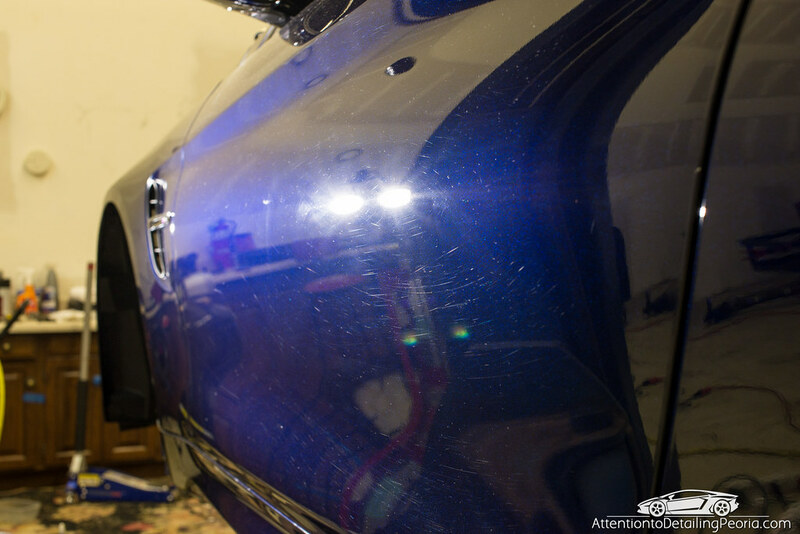 Hey Brandon… here is a section from my article about CarPro Essence where I explain exactly how I use it for finish polishing. Let me know if you’ve got any other questions! Thanks for reading. This is very helpful, just one more question, after Essence is applied would I need to use Eraser before putting on Sealant/Coating or is Eraser not needed? Hi Brandon – unless we are dealing with exceptionally soft/delicate paint where an eraser/ipa wipe would be very difficult to do without marring the finish, we always do an eraser wipe after Essence just to be safe. The product was designed to be used without any wipe down needed, but we are perhaps a little over cautious. Nice job Zach. It seems car dealers have no shame in selling an expensive car in that bad shape. How much more difficult is the 22ple Pro coating to apply than the consumer version? Not very difficult at all with some practice. All 22ple products are made to be user friendly, including the professional grade coatings. Thanks! Great work Zach. Always great to see different products showcased. 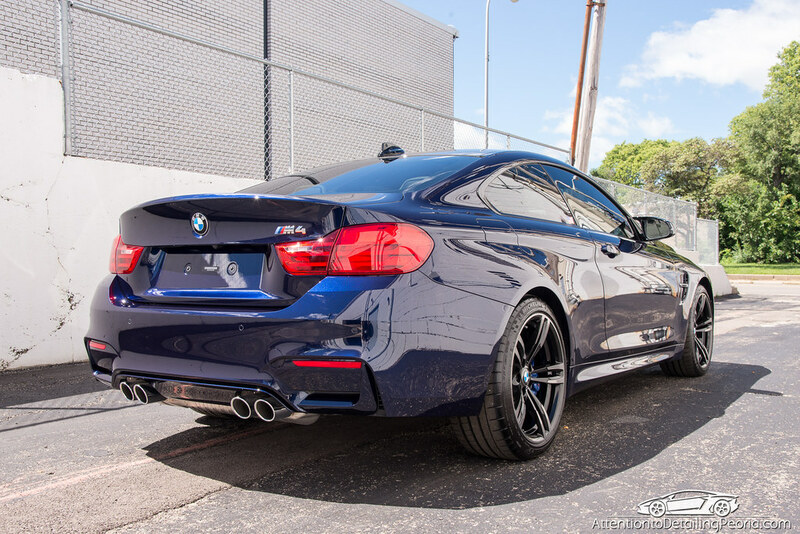 The paint looks flawless. Hi Steve – thanks for the comments! Fantastic Job Zach! 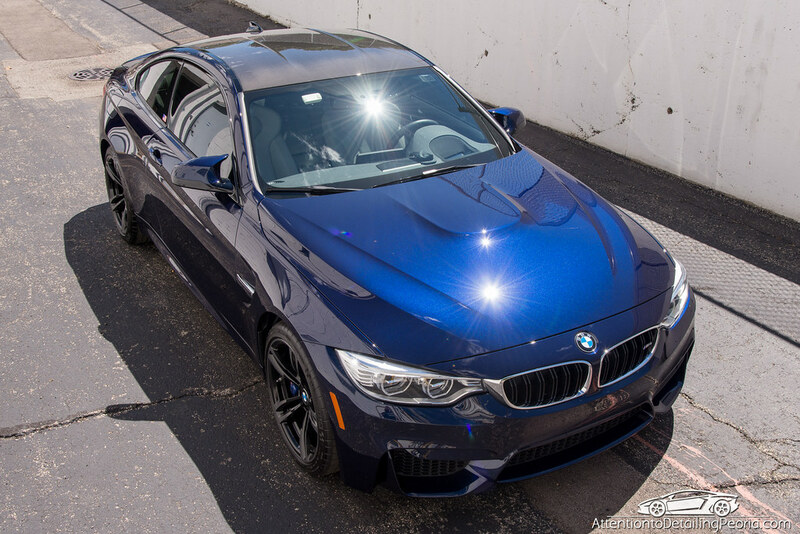 BMW’s dark blue metallic paints when brought to this level are sunning. 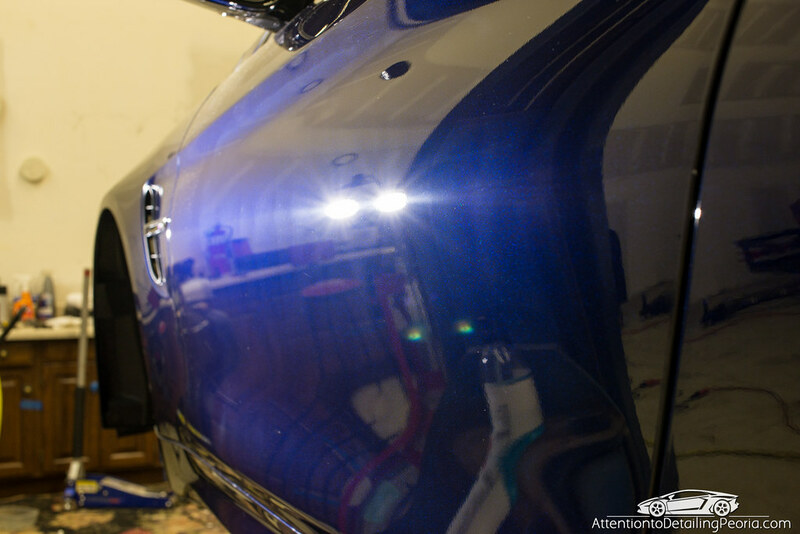 How many hours in this paint correction/detail? Hi MIchael – Thank you for the comments! This job was done about 6 months ago, so I cannot recall specifics on how much time we had in it from start to finish. If I had to guess, it was probably in the 15-20 hour range. Wow Zach,you did an excellent job. While Mistico Elemento is a great product, I’m having no luck selling this application to my customers. Would love to know your marketing technique since 22PLE doesn’t seem to give any help. Hi Ken – thanks for the comments! As usual, another really nice job Zach. 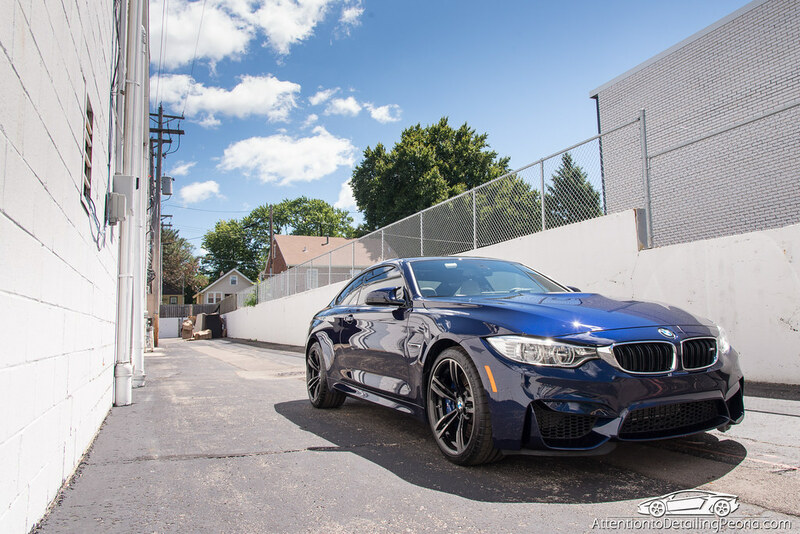 I know you like the Griot’s Fast Correction polish, but curious on your use of the CarPro Essence finishing polish versus the Griot’s Perfecting Cream (which I don’t think I’ve seen you use in your blogs)? I don’t always get the results I expect from M105/205 so am about to order some different correcting and finishing polishes – your guidance is much appreciated. Hi David – we do have and use GG Perfecting Cream from time to time, however I enjoy Essence because of it’s very short working time which produces very fast results. Also, I find Essence to be incredibly simple to wipe away, where Perfecting Cream takes quite a bit more work to remove the residue completely after working it. Perfecting cream does leave an exceptionally nice finish, as any finishing polish should. It has a place on our shelves, I just personally prefer to use Essence when I can. Hope that helps! It does Zach and thank you for taking the time to reply. Hmm, that is one of the attributes I’m also looking for which is ease of removal..just may have to also try the Essence product.